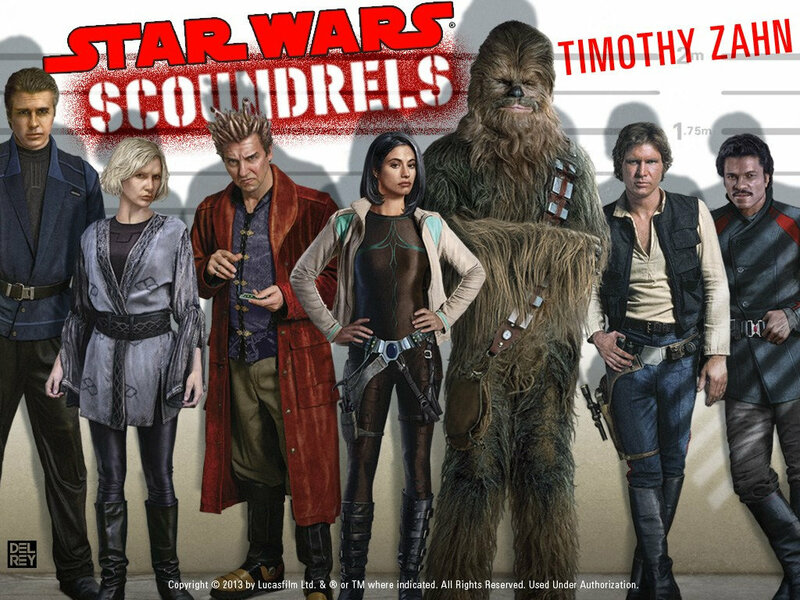 Shifty Rebels is an Australian / Asia time-based guild but welcomes anyone keen to play. This guild is semi-casual, and highly supportive guild, for people who have a busy life with work and family however when they do play they want to do well. With that in mind, we would like everyone to aim for their 600 daily raid ticket goal so we can do heroics more often to improve as a guild. We are currently seeking active players Lvl 85. In addition, we have a second guild – AustraliaEarth which we also support for leveling players, as well as high level players who have become less active and are keen to join a fun, but casual guild. 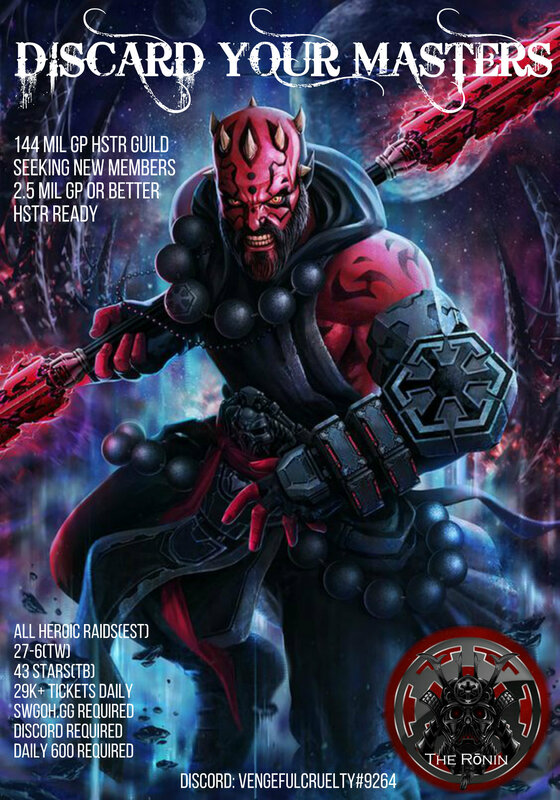 Sith T6 – Continuous every 5-6 days - waiting for more members to unlock JTR and get geared to tackle heroic. Usually win TW's more often than not and are thus far 5-1 in 2019! Time Zone: GMT + 8 (Perth Australia time) / GMT+8 (Singapore, Hong Kong) - Guild daily reset is at 1830 local time or 1030 UTC. We are looking for more active players. We are a very casual but active group with a core group of players looking to step up to higher tiers in game. We are on HPIT every couple of weeks w/ 24 hr join. 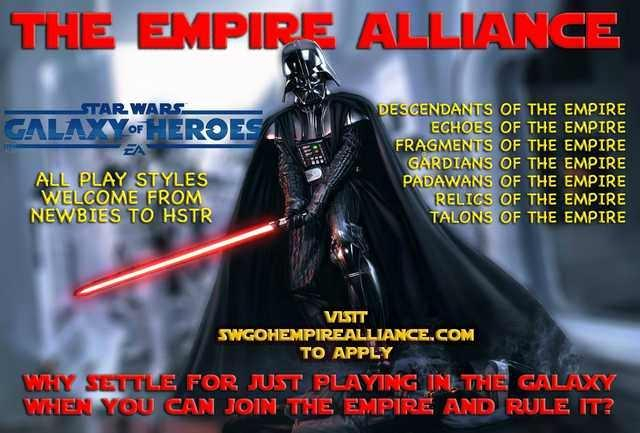 Can complete AAT within a couple days looking to complete HAAT when more active players join. Tier 5 STR within a week. TB can one star at least the first 5 sectors. Again, this is a CASUAL guild but once we get more active players we can progress to the higher levels. At least 400 guild tickets a day. This is a growing guild, but has stagnated lately. We have a core group of about 15 but need that magical number to start TW. 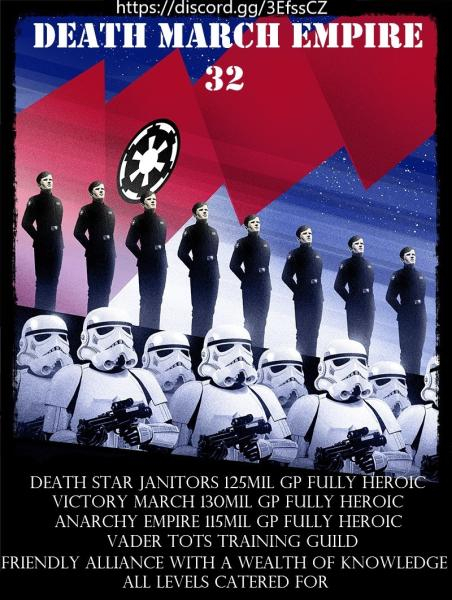 We are part of The Empire Alliance. We are pushing in both TB and TW. No forced farms, but willing to help meet our goals. 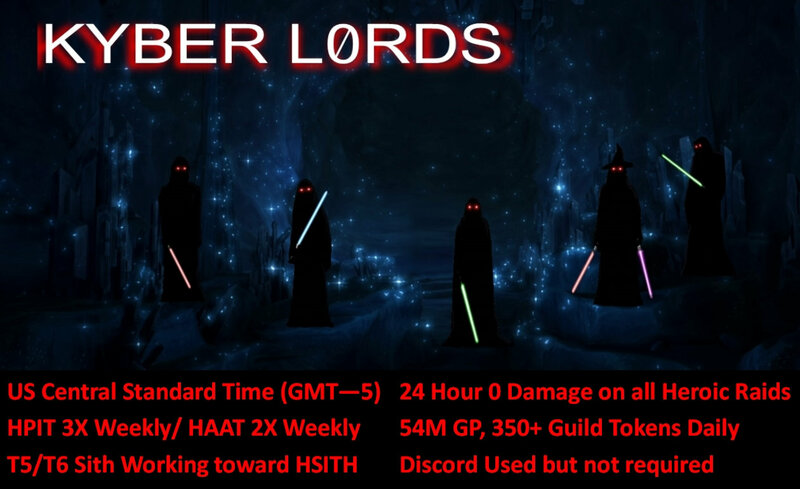 KYBER L0RDS is looking to add up to 8 new players! We're unaffiliated with any alliance and prefer to just keep it casual, but we do ask that you maintain participation in guild events. We have a 90% Win rate in TW's (as long as enough people sign up) and we're very relaxed when it comes to required daily guild tokens. Over 2 weeks inactive gets you booted unless you have otherwise spoken with an officer. "Blood of Wolves" is looking for up to 3 players, preferably L85, but lower ok if actively moving up. Our atmosphere is laid back, and we require only a good attitude and regular activity to avoid removal . Our entire guild, and particularly our officers, give generously in the guild exchange, and are dedicated to bringing along everyone. No farming requirements, so if you have an affinity for Ewoks or Jawas you are free to assemble your team of little weirdos without (much) judgement. Blood of Wolves has taken in a smaller guild before (I was a member of that smaller guild), and has experience integrating groups and individuals into the fold and making them welcome. We have won our last 4 in a row, and are about 75% wins overall. Discord Available, but entirely optional. The Zefiro are expecting a vacancy! One or more current players have been less than active, despite several nudges. So, perhaps their spot(s) can be yours! 162m GP, full Heroic, TB 43*. Based in East US time, hitting the raids around 8:05p after a 24-hour join. Laid-back but active, we will never micromanage you but can provide all of the guidance you desire. All we ask is your regular participation in events, or a notification when you'll be away...cuz hey, real-life happens. Interested parties should have at least 2.5m GP, and/or key squads powered up and ready for action in TW and TB. Contact us on Discord (DocDoom#3475) or Facebook (ZefiroGuild)! Discord is in use but NOT a requirement. VIII (or viii) currently has 1 opening for an active new member looking for a fun, friendly and active guild! Current Guild focus is maximizing Territory Battle star counts. We usually win TW and can clear HSTR in hours. We are a mostly North American based guild, but we have several members in Asia and Europe. That means there is almost always someone online! HPit runs 2 to 3 times per week. Weekday starts are 10PM EST; weekend starts 3PM EST. Strict 24-hour zero damage rule in effect! Solo efforts are allowed to post 15 minutes after raid start time. HAAT runs 2-3 times per week. Weekday starts are at 9PM EST; weekend starts are at 3PM EST. HSTR runs at least twice a week and completes in under 12 hours. TW – 35 wins and counting! We rarely lose. We are in the 3 zeta bracket for a win, 2 for a loss. One guild officer coordinates offensive and defensive strategies. 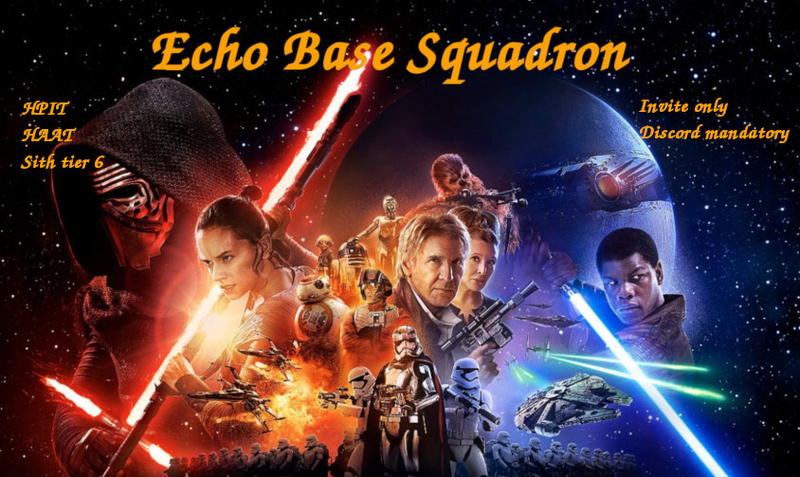 Must have ready squads (NS, FO, Sith, Jedi, BH, Empire, Phoenix, Scoundrels, etc.). Discord is in use and encouraged, but it is not required. Discussions other than SWGoH encouraged! Guild activity reset is at 7:30PM EST. We have no requirements for raid tickets; just do what you can. We all have lives to lead! If interested, please either reply here, PM me, or contact myself or another guild member. In-game I'm both Dark Helmet (561-425-188) and Upgrayedd (563-833-936). *Deep Space DankRollas* is a small up and coming guild. Our goal is to get new and active members to help us do heroic tier raids. We have an active exchange and no minimum level requirement. As spots fill up rules will become slightly more strict, at which time we will add a minimum log in activity requirements. If you have questions about the guild or any of its members please contact LemonLife13 or just come give us a try! https://swgoh.gg/g/12865/finalorder/ Looking for guildmates with 2.8M+ GP. 41-42 stars in TB's. We run HAAT, HPIT, and HSith all on Farm. 9PM Eastern time is when we launch raids. 24 hour period to join. Looking for a 50th to fill out our HSR farming guild. We're 147M+ GP, 40+ LS/DS, all about to unlock Traya. 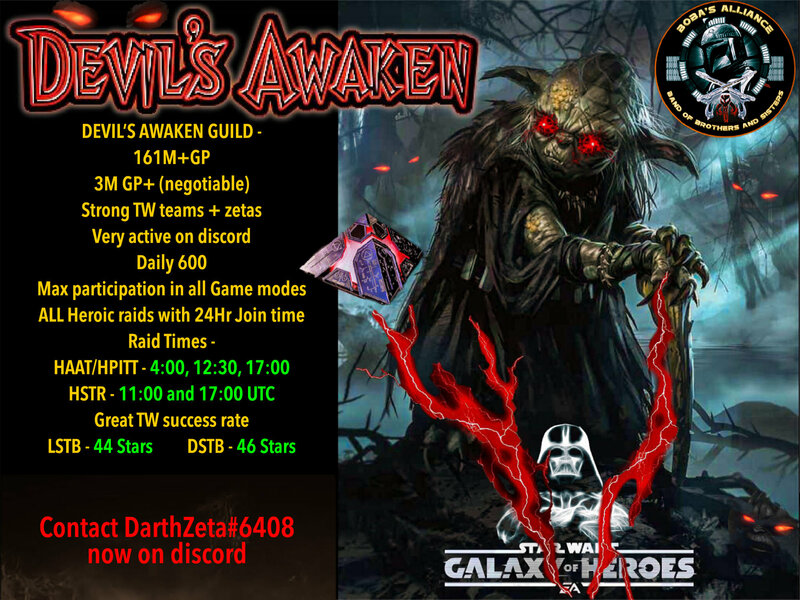 Since the inception of TW our guild has missed out on only 2 due to missing a few signups and of the rest we have lost only 1. The previous few TW have put us in the upper portion of the 50M bracket. In TB we typically achieve mid to upper 20's for star levels. We do not have any specific requirements for participation since this started as a group of friends and coworkers but we have had some members stop playing and have multiple spots available at this time. We officers to occasionally go through the roster and weed out the inactive members as long as we can continue running the T6 raid but with trying to move into HSTR we will be more proactive in maintaining the player base and activity level. We have several very strong accounts and welcome new and old players alike but would prefer players have at least 2 of the 3 Heroic characters available. We will help you get gear as longs as you put requests out daily and can offer in-game help as well. if you are interested please come join us and if you have any other questions message me here on the forum or in-game. Currently focused on maximising the star count for TB. HSTR goes down quick and we usually win TW. -We currently have 5 open positions. 45/50. We are a solid active guild with veteran/senior players majority 30+ have been together since 30m GP and have naturally grown to 90m. We are looking for the remaining 5 to join us on our conquest. We are growing at a fast rate and need the last dedicated 5 to join us. It's a great privilege to be apart of this guild! look no further. Welcome to DM here also. We are a mixed nation guild, very kind and helpful and we are recruiting again. 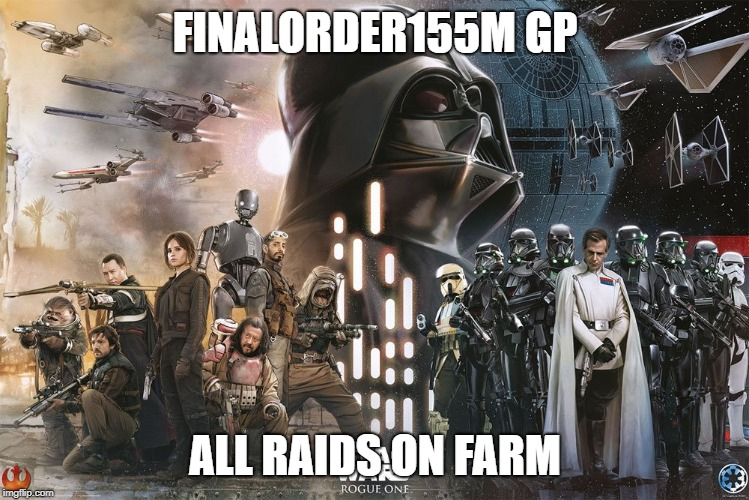 All heroic raids are on farm. No alliance guild. We have 161M+ GP and 42* last LS TB. 44* on last DS TB. We are looking for active players, level 85 and good GP (~2,2M). We do not have a 600 raid tickets per day rule, but we expect you to contribute as much as you can. For communication, raid rules and helping each other we use Discord which is mandatory. If you are interested or have any questions feel free to message me on Discord or leave a message here. My ID on Discord is Snoob#0802. Guardians Of The Northern Lights is an independent european guild looking for two new members. We are laid back bunch of awesome people having fun with the game. Currently we have 49 players and 96mil GP and we are looking to fill our roster. 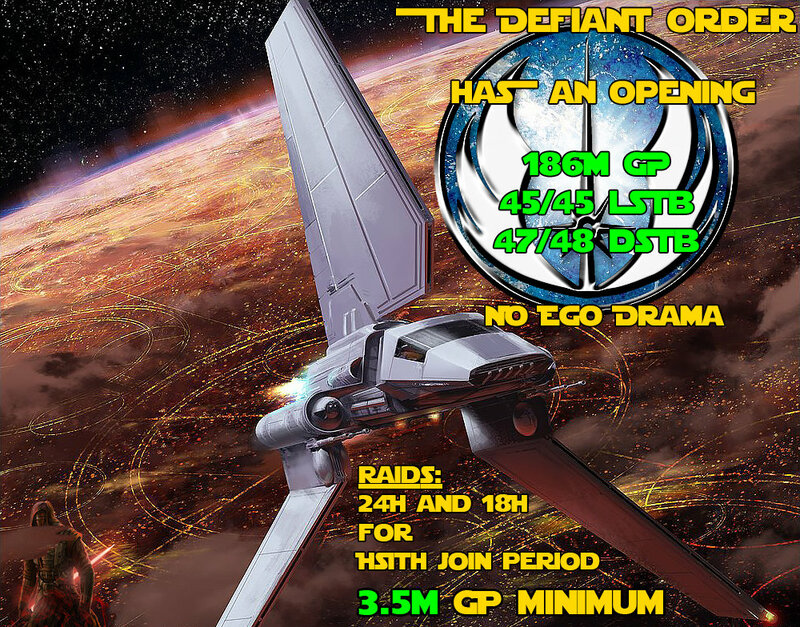 DRIVEN - 108m GP US-based Guild looking for active players to contribute and help drive to the next level. * We have an OPTIONAL Discord server for those who want to chat there, but it's not required.